With over 40 years in the Martial Arts and a full time Instructor and Studio owner since 1985, Kwan Jang Nim Voelker is a wealth of knowledge. He is the President and Founder of Pyong Hwa Kunin Tang Soo Do in 1998 and Co-Founded the International Goodwill Tang Soo Do Association (IGTSDA) in 2000. He is an Executive Member of the Board of Directors and Co-Founder of the United States Goodwill Tang Soo Do Assocoiation (USA affliate of IGTSDA), and is the Vice President of the World Dang Soo Do Union USA. Kwan Jang Nim Voelker is a 8th Dan and a student of Great Grandmaster Song Ki Kim. 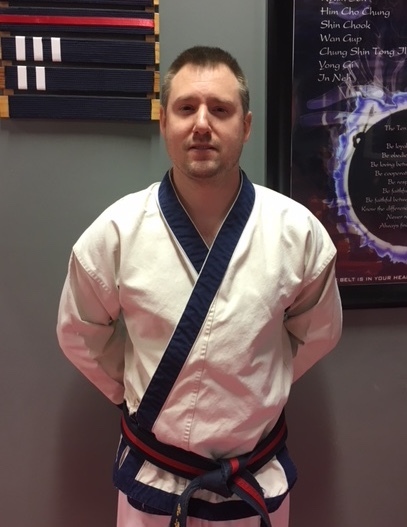 He has trained under many of the greats of Tang Soo Do; including KJN Charles Ferraro (his 1st TSD instructor), KJN Hwang Hyun Chul, KJN Andy Ah Po, KJN Robert Beaudoin and KJN Shin Jae Chul. He is a 5th Dan in Shio Karano JuJitsu under Soke Clement Riedner and a 1st Dan in USMA Judo under O'Sensei Phil Porter and Soke John Larlee. In addition to teaching full time at Middlesex Tang Soo Do Academy, Kwan Jang Nim Voelker has taught Fight Cut Combatives to Soldiers stationed at Fort Bragg in North Carolina. He has 2006 Greece, 2007 USA and 2010 Korea. He is the Executive Director of the USGTSDA National Championships. Kwan Jang Nim Voelker has often been heard to say, “We don’t just teach kick and punch, we develop champions for life”. Jeremy Stickel | Student Manager Master Jeremy Stickel is the student manger of Middlesex Tang So Do Academy. He has many duties, among them are instructing class, introductory lessons, student memberships and demo team coach. Master Stickel has been an Instructor at MTSDA since 2004, in that time he has proven to be an excellent role model for all of our students. He is involved in every aspect of training for our Little Dragon, Karate Kid and Teen Programs. As the coach for our Middlesex Demonstration Team, he tirelessly prepares our team for events both in and outside of the Academy. If your interested in class for yourself or your child please give Master Stickel a call at (860)388-6300.